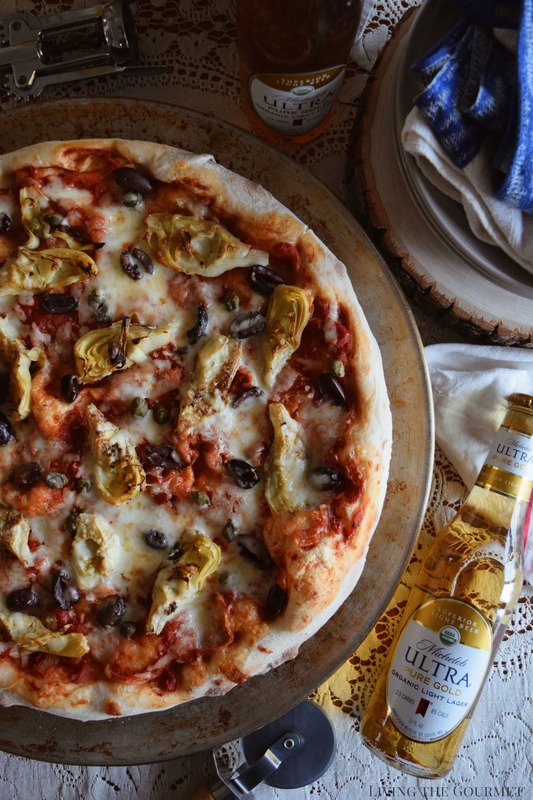 We’re kicking up game day with an Organic Capers, Olives, and Artichoke Pizza! 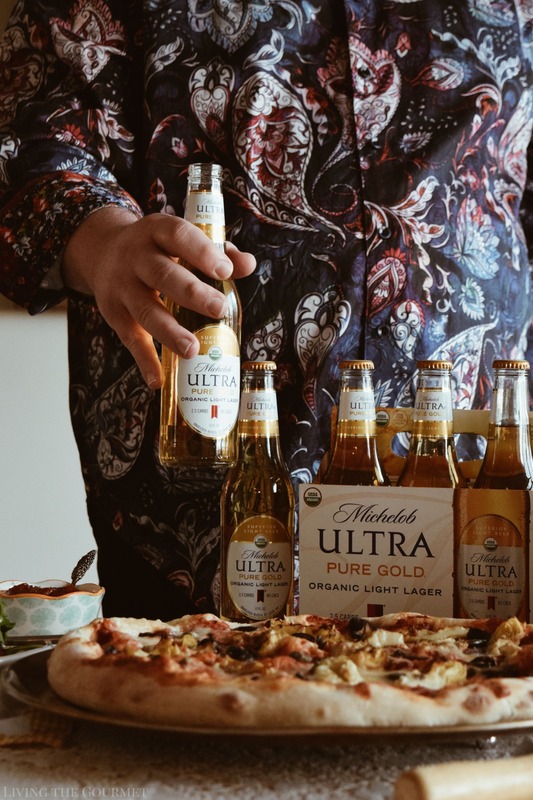 Served alongside Michelob ULTRA Pure Gold, your watch party is sure to be a hit. 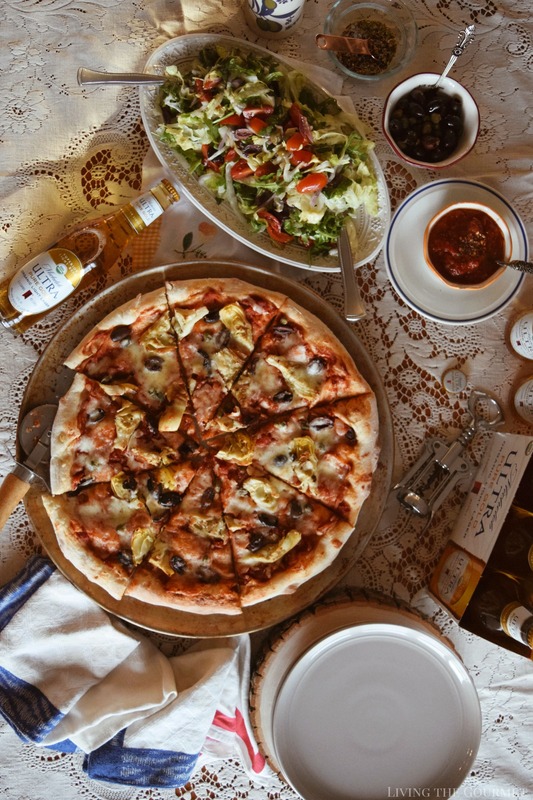 Pizza and beer are one of the most quintessential game-day combos, it’s basically layering fun on top of fun, or like heightening one guilty pleasure through the addition of another. Today, however, we’re taking a little bit of guilt out of both parts of the equation – while heightening, rather than skimping, on the flavors. For me, this has been something of a way of life, but one that I don’t really even need to make a conscious effort towards. 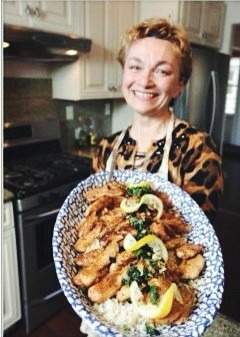 I grew up with a love not just of food, but of ‘real’ food, of putting together meals from natural, ‘whole’ ingredients. 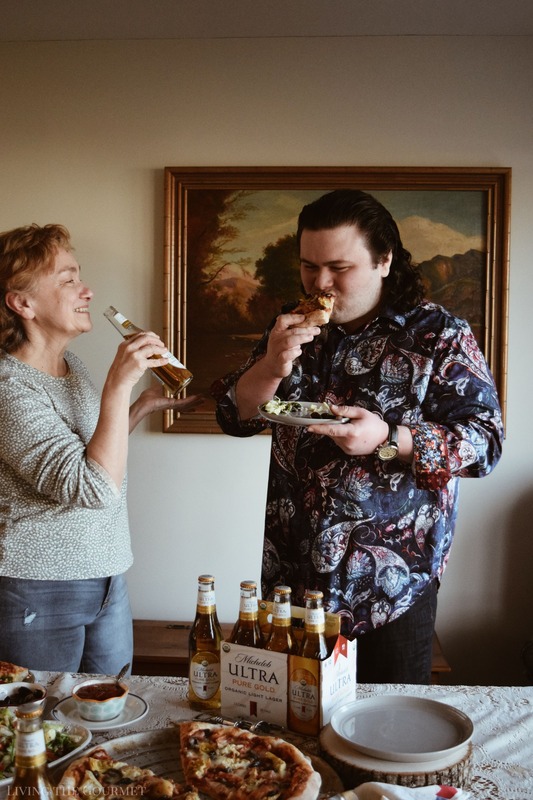 My mother, for example, bought ‘locally sourced’ produce directly from local farms long before there was ever even an internet for hashtags like #sustainablysourced or #locallygrown to trend on. It was just what we did, and even though virtually all of the local farms in my area have been paved over, I’ve nevertheless continued that kind of cooking and eating into adulthood. Like Wolf Gang puck espouses, your palate becomes trained not only to appreciate ‘good’ flavor but ‘real’ flavor. And truth be told, once you become accustomed to the taste of olive oil over sprays or diluted vegetable solutions, or to freshly crushed and chopped garlic over powders or ‘seasoning liquids,’ you cringe a little at the thought of turning back – not solely because of health considerations, but because of flavor as well. Today, I decided to carry that mindset over to my Super Bowl prep. 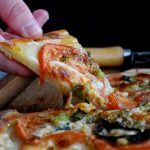 I decided I wanted to prepare an indulgent pizza from start to finish using only organic ingredients. 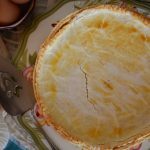 Yet, I wouldn’t be skimping on flavor, hardiness, or satisfaction – just the opposite as you can see from the ingredient list and the pictures. 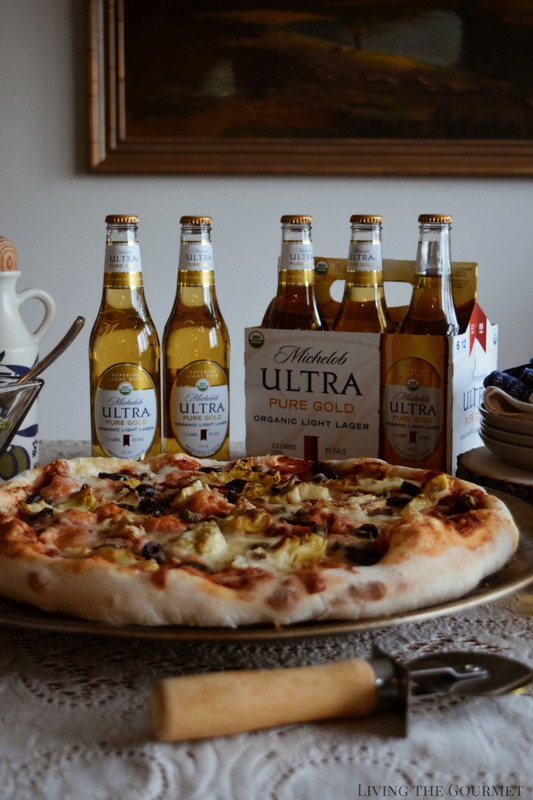 To go with this pizza, I’ll be pairing it with a Michelob ULTRA, which is a new, first of its kind 100% organic beer, which is made with natural grains and has no artificial colors or flavors. 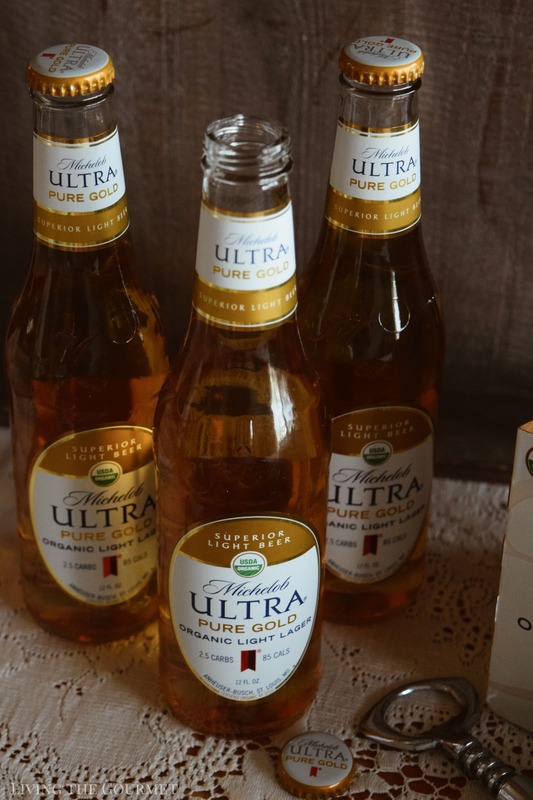 Aside from being organic, Michelob ULTRA is lower in carbs and calories than a glass of wine, having just 2.5 carbs and 85 calories per bottle, making it a choice you can feel good about this Super Bowl. To start things off, we begin with a homemade pizza dough, for which I used the recipe in my humbly titled Perfect Pizza. From there, in a saucepan, we combine garlic, onions, and a drizzle of olive oil, and let that cook until the onions are translucent. We then add in crushed tomatoes, a dash of sugar, a bit of salt, oregano, and red pepper, and let that come to a simmer. Note that all of the ingredients I listed here are USDA certified organic. While that simmers, in a small saucepan we lightly grill one cup of halved artichoke hearts, and then set them aside. Now, select your pizza pan and give it a thin coating of cornmeal. Once that’s done, roll out your pizza dough to fit the size of your pan, and then set the dough on the pan. Now, you can probably piece together what to do next. Have you guessed? If not, it’s time to put on the sauce and toppings. First up, ladle out a generous portion of sauce onto the prepared dough and spread that around as evenly as you can. I’m sure you’ve watched your local pizza guru do this a million times, right? Then, toss on the grilled artichoke hearts, followed by a sprinkling of capers – I personally like a lot of capers, but that’s just me – and then the olives. Now, next up…do I really need to spell this out? Mozzarella. Make it snow my dear friend, and then lash the pie a few times with olive oil, and slide it in the oven for about ten minutes at 425 degrees Fahrenheit. Then, crack open a few Michelob ULTRA beers, serve those with the pizza, and start rooting for your team of choice. And just like that, you’ve got an indulgence laden Super Bowl that’s organic and low on guilt from start to finish. In a large saucepan, sweat garlic and onions with a drizzle of olive oil. Once the onions are translucent, add the crushed tomatoes, sugar, salt, oregano, and red pepper. Bring the sauce to a simmer. Meanwhile, in a small saucepan, lightly grill the artichoke hearts. Setaside. Sprinkle a pizza pan with the cornmeal and roll out your pizza dough to fit the pan. Top the prepared dough with a few ladles of fresh sauce, grilled artichoke hearts, capers, and olives. Sprinkle generously with mozzarella cheese and drizzle with olive oil. 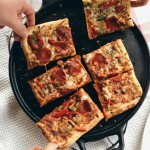 Bake the pizza for about 10 minutes or until the pie is slightly golden and bubbly. Remove and let cool before slicing. Serve and enjoy! For more delicious game day inspired dishes, check out Tastemade Super Bowl Recipes for Super Bowl! To kick off the big game festitivies, we’re hosting a special giveaway and giving one lucky LTG reader a $25 Visa Gift Card. Be sure to enter daily! Pizza and beer...now let's party! Dear Dave, Sounds good with the shredded chicken too. Have a great day and enjoy the game. I love this gourmet twist on pizza and beer. I have to make this fancy pants goodness. Om nom nom. This sounds like my absolute dream pizza! I love all of these flavours. Cannot wait to try soon! 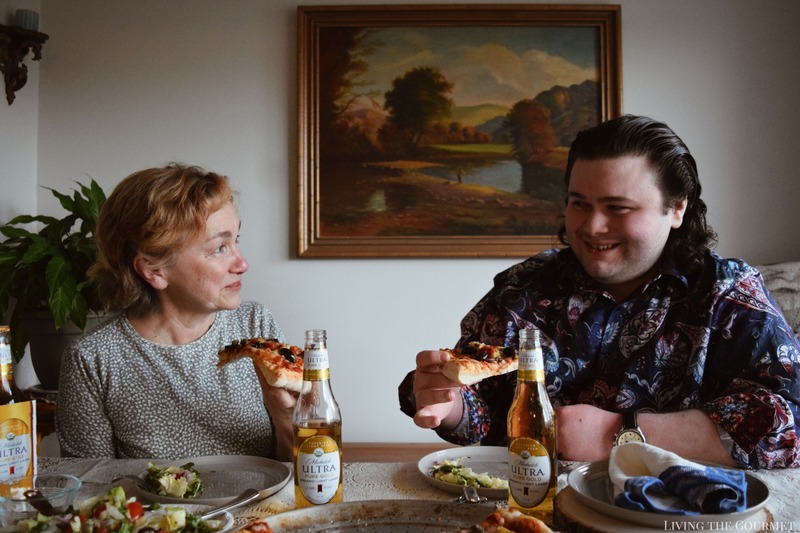 I'm not a beer drinker but that pizza looks amazing. My mouth is watering lol. Thanks for the giveaway, entered! I love the look of this pizza and make me hungry already. 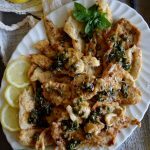 The thing I like about this recipe is the ingredient, you have chosen to use organic cornmeal for dusting pizza pans which is something I didn't realize I can also use. Thank you for visiting. I am glad you enjoyed this recipe. Wow! I watched both YouTube videos that came up. The pizza looks delicious. The chicken wings look amazing. Thank you Tammy. I am glad you enjoyed the videos. Thank you for visiting. Artichokes and olives is one of my favorite vegetarian combination. I know they go really well on pizza. I like the idea of adding capers, to balance the saltiness. I love this combo too. Thank you for visiting. Thank you. It was a fun a tasty meal to enjoy! Looks delicious! Shared your video link. Thanks for the opportunity. That pizza looks delicious and would make a perfect game day treat! Thank you for sharing! 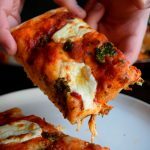 This pizza recipe looks like something I would love. I also think the buffalo chicken 7 layer dip on the Experience Organic YT page looks good. Yum! That looks like serious 'movie night in' treats. I love pizza and your one looks amazing! 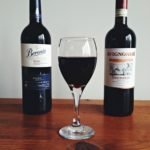 What a fabulous combination, so perfect for weekend family or friends dinner parties. 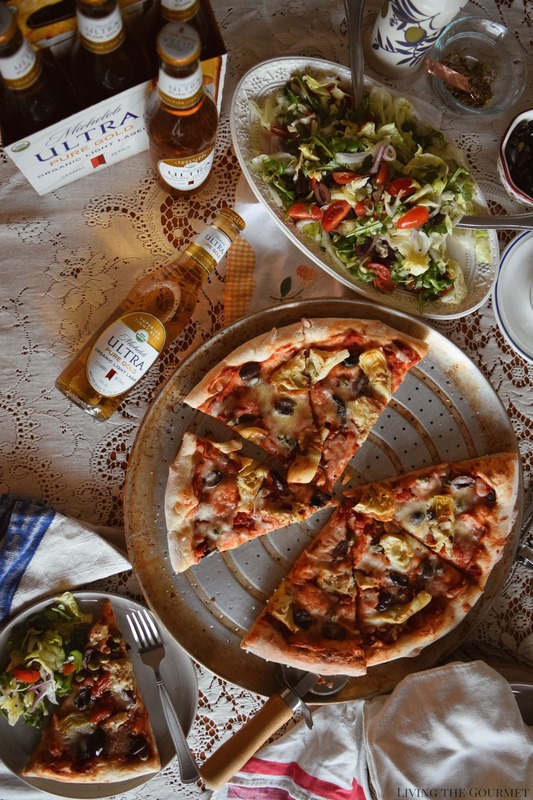 The Ultra Gold beer is such a great accompaniment and certainly goes so well with the pizza. Enjoy! You said it! Thank you Christina!